The Orion constellation is visible from October through March. Orion and its surrounding star groupings are the subjects of some quite imaginative ancient myths. the lead star in Orion's belt. These myths when recalled can be useful memory jogs to help us locate and recognize star patterns, a most useful skill when it comes to direction finding. According to my limited understanding of Greek mythology, Orion was a great hunter with an even greater ego (reminds me of a few of my friends :-) ). In the northern hemisphere, we see his outline in the fall and winter night sky--one arm held high, the other outstretched and holding his bow. His trailing shoulder is formed by the red giant star Betelgeuse (beetle-juice). Orion's three-star belt is his most distinct feature, and from a navigation standpoint, his most useful feature. More on that, later. According to legend, Orion had a thing for Atlas's seven daughters--known as the Pleiades--which, by the way is that tiny star grouping that carmaker, Subaru, using as a logo. As the story goes, Atlas's daughters didn't care much for Orion's attentions. To protect his female offspring, Atlas placed Taurus the Bull in the sky between Orion and the Pleiades. You'll recognize Taurus by his distinctive V-shape, and his big menacing eye, formed by the giant red star, Aldeberan. Orion has a couple of hunting dogs (just like my friends mentioned above)--Sirius (the sky's brightest star) and Procyon--which follow him across the night sky. 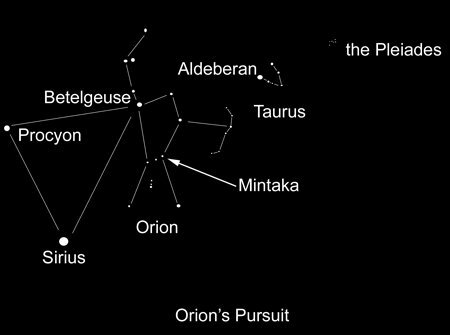 Summed up, here's the order of Orion and the other players in the drama: At the head are the Pleiades, followed by their protector, Taurus. Taurus is followed by Orion with his bow. Finally, Orion is followed by his two hunting dogs, Sirius and Procyon. To help identify these last two, it's useful to know that Betelgeuse, Sirius, and Procyon form the three corners of a prominent, nearly equilateral triangle. This is known as the Winter Triangle. The Drama of the Orion Constellation. Notice Mintaka, an important direction finding star. The mythology proves useful because it provides a memory hook to help make sense of a portion of winter's night sky. Now, back to Orion's belt. The three-star belt's lead star is Mintaka (min-TA-ka). In my estimation, Mintaka is the second-most useful star for direction finding, bested only by Polaris. The reason for its usefulness is that it ALWAYS rises due east and sets due west, no matter where you are on earth. In the northern hemisphere, Orion rises in the east on his back, travels across the southern sky, then sets on his face in the west. In the southern hemisphere, he likewise rises in the east on his back, but he travels across the northern sky to then set on his face in the west. The closer you are to the Equator, the higher is Orion's path across the sky. At the Equator, Orion passes straight overhead. But, regardless of where you are on earth, Mintaka always rises due east and sets due west. Because the horizon is often obscured from view by trees, mountains, or other obstacles, on any given night, chances are you won't see Mintaka at the moment it rises due east from below the horizon, but are most likely to see it some time later, when it's higher in the sky. For the first two or three hours after Mintaka has risen, you can retrace its path back toward the horizon and to the spot from which it rose. To do so, imagine a line from Mintaka back to the horizon at an angle of 90 degrees minus your latitude, north or south, it doesn't matter. Where that line intersects the horizon is due east. Conversely, two or three hours before Mintaka sets, you can find west by projecting its path forward to the horizon, once again at an angle of 90 degrees minus your latitude. Where your imaginary line intersects with the horizon is due west.